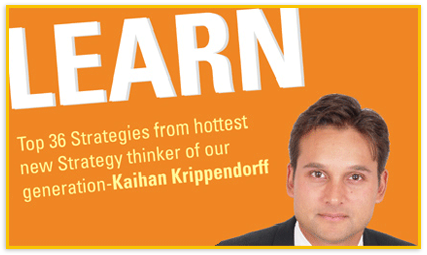 Don’t miss the unique opportunity to participate with one of the hottest new strategy thinkers of our generation-Kaihan Krippendorf. Microsoft, Cisco, Walmart and other leading firms are purchasing his time as they prepare for the competitive battles ahead. This ex-McKinsey strategist makes it simple, which I like. Be a part of this intimate seminar as Kaihan gathers with 100 CEOS and Executives of Indian business for candid discussion on Strategy and success. This program hosted by Knowledge Capital once a year, is your only chance to work with Kaihan side-by-side and have him address your professional challenges head-on. How to formulate the most effective strategy for your organization and how to execute it. You will reach “strategic clarity” with a list of seven strategies with the greatest potential for solving your Business challenge with the least effort. The growth challenge: How to conquer new markets and maintain a high level of productivity. Exploring the new business environment: Strategies to successfully navigate transformation and change. The role of strategy in innovation and change. You will think more creatively about a real strategic challenge you face today. You will generate 30 to 200 new potential strategies for solving this problem. Copyright ©2009 Knowledge Capital. All rights reserved.